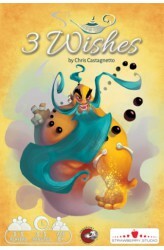 3 Wishes is a party/family game for 3-5 players that plays in 3-5 minutes. With simple rules, this memory, intuition and bluffing game is as much about playing the game as it is about playing the other players. A poker face will go a long way – well, not too long, since the game may last only three minutes – and it will also serve you well as a fast and fun memory training. A not-so-nice-but-not-too-evil genie appears as if from nowhere (someone, somewhere probably did rub a lamp) and pitches the crowd against one another, granting the most astute player no fewer than three wishes — but not all wishes come true, and only the player with the right balance between super powers, benefits for the world, and selfish gifts will be enter the good graces of the genie. 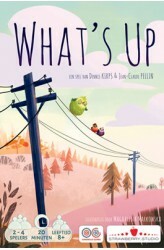 In more detai..
What's Up is a fast card-flipping game in which you race to collect sets of birds first. To set up, shuffle the thirty double-sided cards, then lay them out on the table in a grid. Each card features 1-3 birds in one of four colors — red, green, yellow, purple — with the reverse of the card having either the same number of birds in a different color or the same color of birds in a different number. Thus, each number+color combination appears five times in the deck. On a turn, choose a card in the grid, then flip it over. If you can add it to your collection, do so; if not, return the bird to the grid with the newly revealed side face up. Your goal is to collect sets of birds in a single color, with you needing to take the single bird first, then the pair, then the triplet. ..